During my first visit to Egypt I was offered to try a mango juice. I was not sure why it was such a big deal to have a mango juice as I was not expecting anything special (who did not have a mango juice, right?) until I took my first sip… It was the most amazing drink I have ever had in my life. I never expected any juice to be so delicious and refreshing and at the same time quite filling. When asked how this juice is done I was told that the fresh mango slices are mixed with either water or ice cubes and simply blended. I could not believe it was so simple and yet so tasty. I felt like I rediscovered mango all over again. Mouth-watering and juicy, mangoes are rich in vitamins and minerals. Mangoes are full of fiber so you should definitely consider consuming them regularly if you have any digestion/constipation issues and particularly would like to lose weight. The feeling of fullness that mangoes give stays long and helps eat less. One of the most ancient fruits, mangoes are the most popular fruit in the world. There are hundreds of recipes which make this exotic fruit so versatile and easy to consume. You can use mangoes in fruit salads for delicious and healthy deserts and in green salads to add that extra twist to your basic tossed greens salads. Blend mangoes with yoghurt and enjoy an amazing yoghurt drink – mango lassi – a regular of the Indian cuisine. They can also be made into fantastic sauces for meat and mango ice-lollies for children, which you can easily make at home are a really healthy and tasty option since you don’t need to add any sugar to sweeten them. If you are still not convinced that you should eat mangoes, please take a look at the below health benefits that it offers and I bet you would want one right away. It is not without reason that mango is called “the king of fruits”. Vitamins: Mangoes are rich in vitamins, especially vitamins A (vision, bone growth, skin health) and C (immune system, collagen formation, which is important for body tissues and blood vessels). Good levels of vitamin B6 (brain function, immune system, lowers risk of anemia, bladder infections) and other B-group vitamins as well as E (protection against toxins, eye disorders, diabetes) and K (healthy heart, strong bones, blood clotting) make mangoes even more attractive. Eating one mango (around 200g or 7 oz) will provide you with the following daily values (DV%) of vitamins: almost 100% of vitamin C, more than 30% of vitamin A, 14% of vitamin B6, 12% of vitamin E and 11% of vitamin K.
Fiber and enzymes: Fiber and digestive enzymes contained in mangoes will help to improve functioning of your digestive system and relieve constipation. One mango will fulfill 15% daily requirement for dietary fibers. Mango contains pectin, a soluble dietary fiber, helps to lower the cholesterol levels. Minerals: Copper and potassium as well as trace amounts of other minerals, including selenium, magnesium and iron, are also worth mentioning. Copper helps your body with production of red blood cells, while potassium helps to regulate blood pressure and maintain muscle contraction. Sugar: Mangoes are high in sugar (about an ounce per fruit). However, it has low low estimated glycemic load, which means eating mangoes should not increase your blood sugar levels significantly. So, people with diabetes can consume mangoes, albeit at moderate quantities. 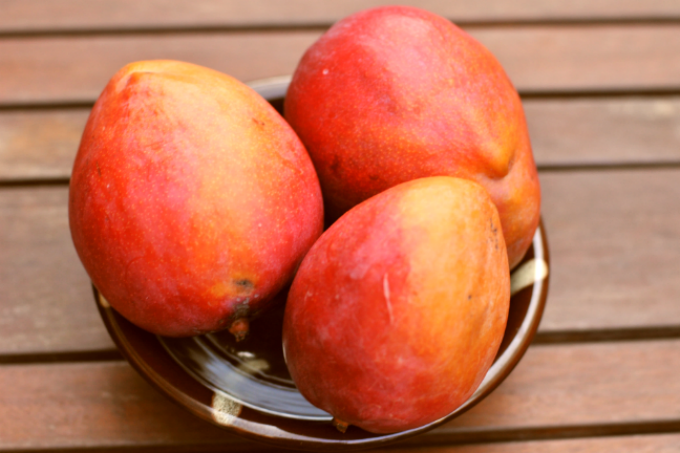 Antioxidant and anti-cancer qualities: quercetin, astragalin, betacarotene and other flavonoids as well as abundance of above-mentioned vitamins, minerals and fibers provide mango with its powerful antioxidant properties. Consumption of mangoes is believed to lower the risk of breast cancer, prostate cancer, leukemia, colon cancer, oral cavity cancers. The above qualities make mango a very healthy snack. While it is preferable to eat fresh mangoes, you can always buy dried or canned mangoes. But bear in mind that if you are buying dried mangoes, try getting unsweetened ones and without artificial preservatives. And one last thing. I have always struggled to peel mangoes: it was quite a messy process and it took me forever to do it. But then I saw a video on youtube, which showed how to peel a mango under 10 seconds! So, if you still don’t know how to do it properly, I would highly recommend watching this video.